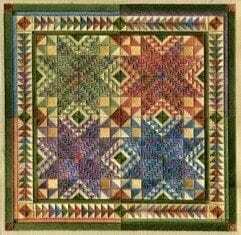 Laura J. Perin has beautiful charts with exceptional designs. This is her latest in her American Quilt Collection and one of my customers clued me in before I’d even seen it! Beautiful sage green, plum lavenders, denim blues and adobe rusts are surrounded by a mellow tan – reminding us of the splendor of autumn. There are four six pointed stars on this piece and a stunning border of arrowheads. Laura suggests color changes and encourages you to change if you want to do so. Her instructions and charts are clear and easy to read. We’ll be happy to kit this up for you! It calls for 18 mesh canvas cut 13 x 13 for a 10 x 10 finished size, one Watercolor, five perle cottons, two flosses, and two Soft Sheen Fyre Werks.